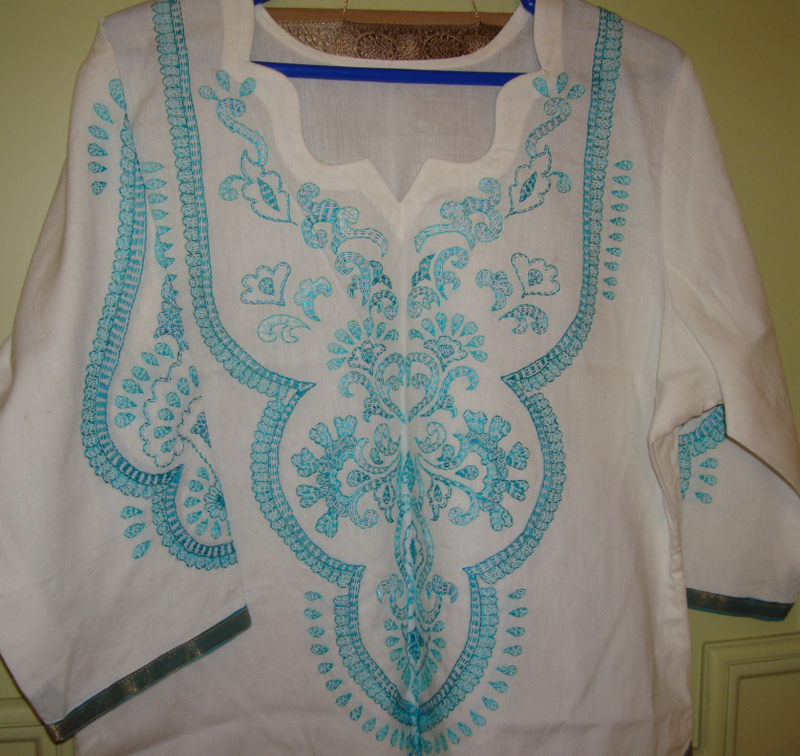 I have been embroidering on wearables – tunics, blouses for quite some time. 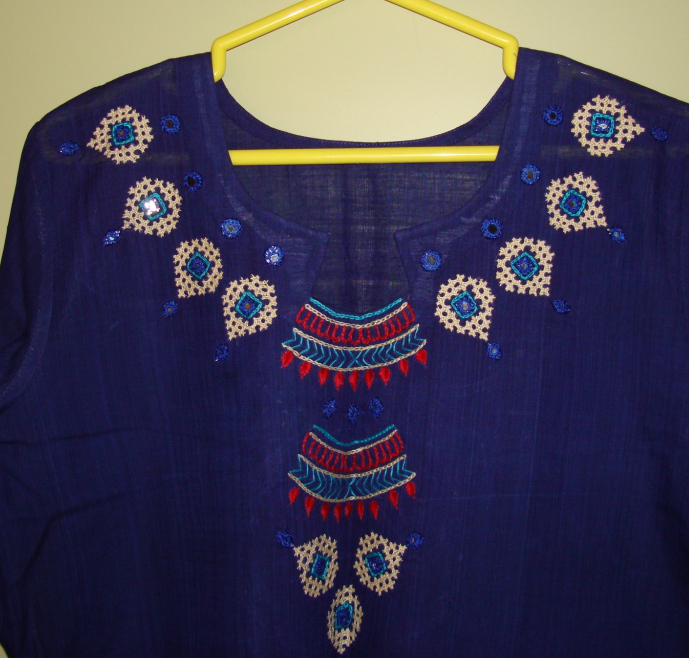 On hand embroidery lovers group on Facebook, there was a request to provide the details about this work. 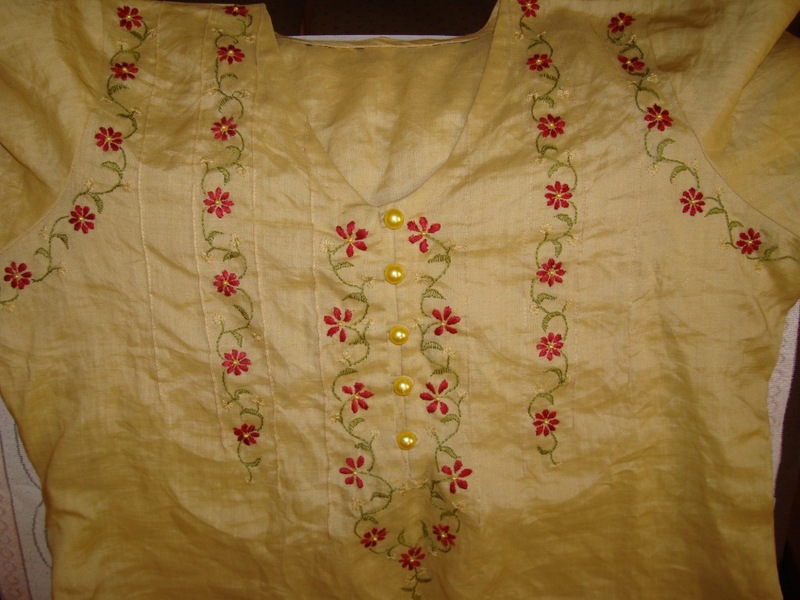 I am starting this short series hoping it would benefit the people who are searching for instructions to embroider on wearables. 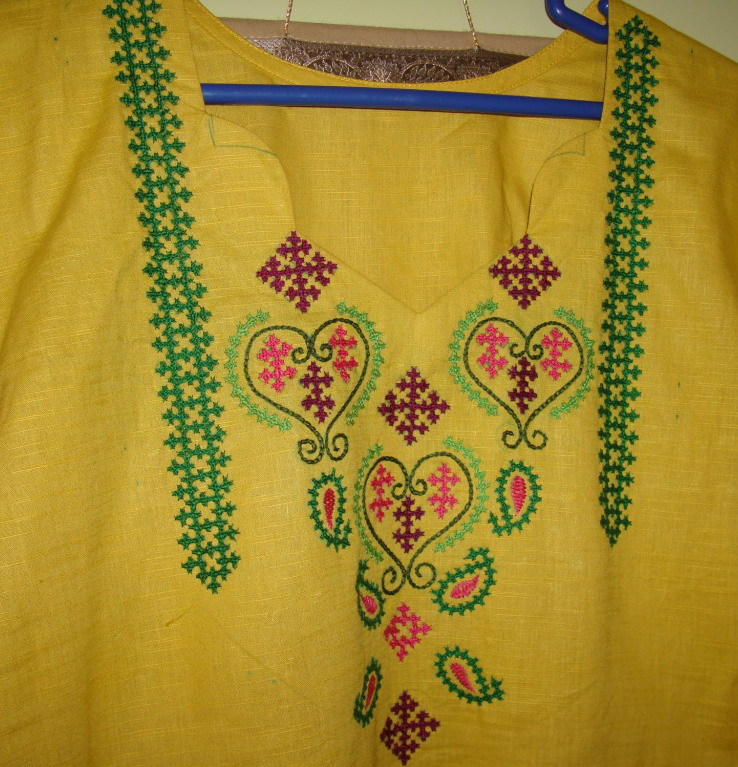 When I started embroidering on wearables, I started with stitched blouses for sarees. 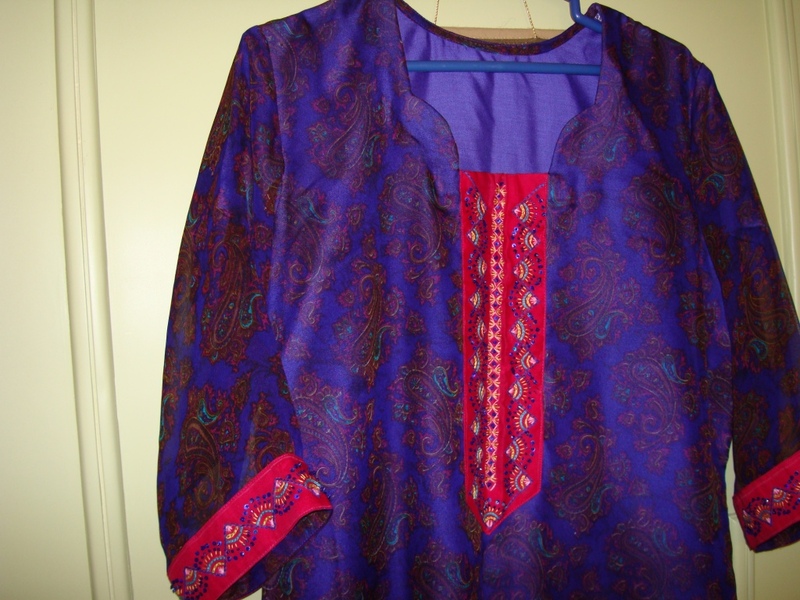 But on this series, I‘ll start with simple embroidery on tunics, sleeves with some samples. 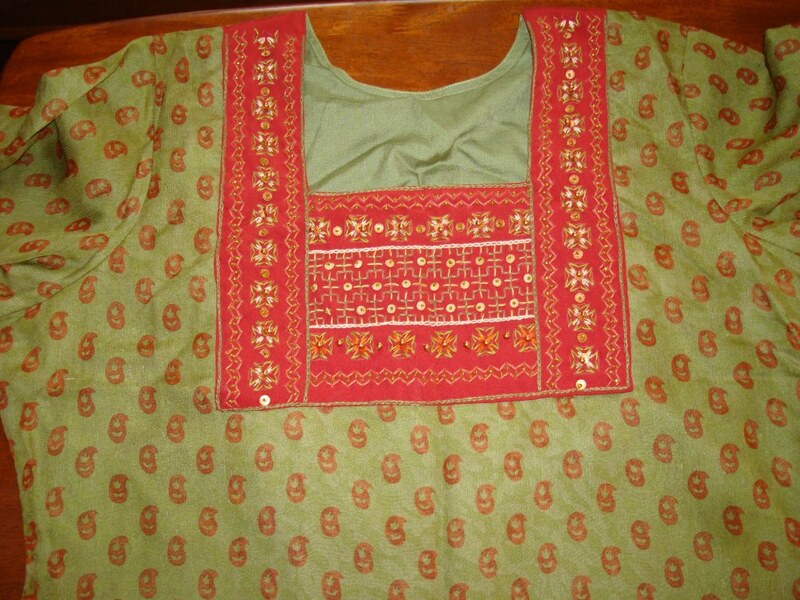 We’ll start with borders worked on separate fabric, which can be attached to the tunic sleeves later. Pencil, scale, white, yellow carbon. 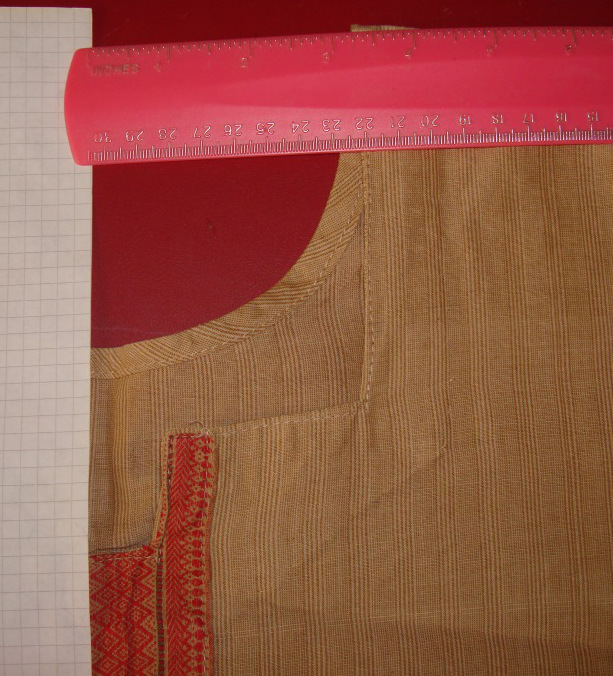 Start with the measurements. 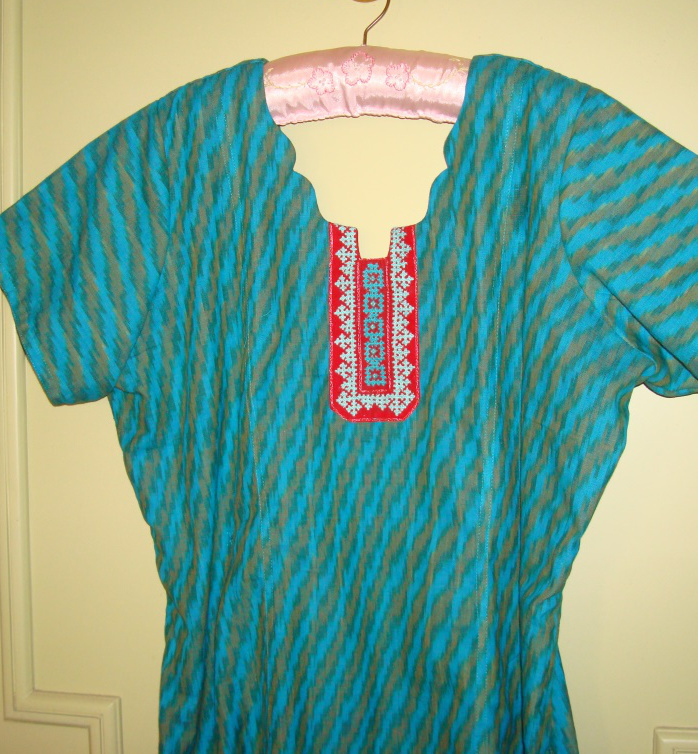 Take a tunic which fits you perfectly and measure around the sleeves, it can be half sleeves, three fourth sleeves, or cap sleeves. Note it down. 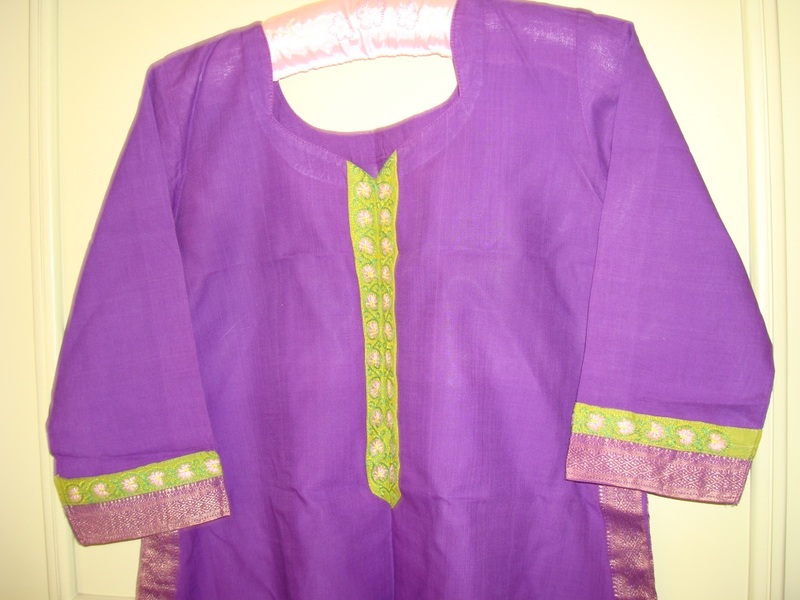 Give an allowance of 1.5 inches on both sides extra. 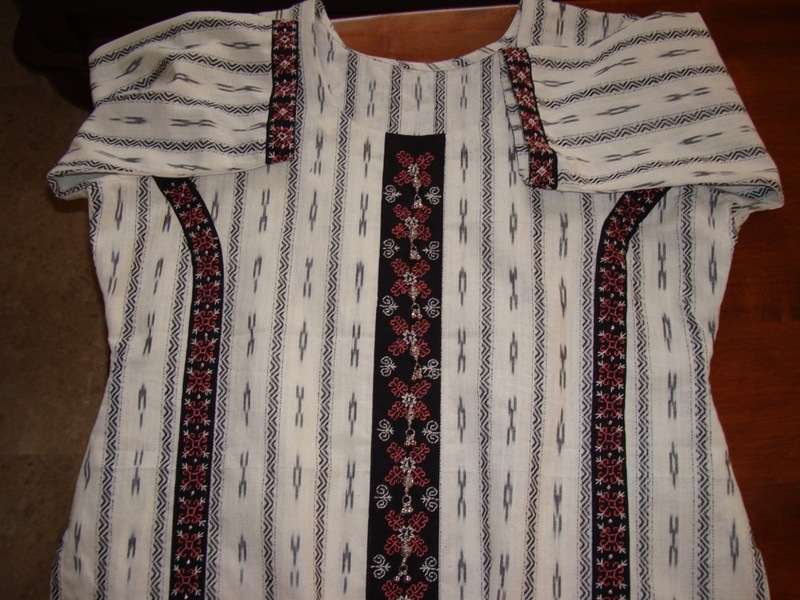 Same way choose the length required for the front of the tunic. 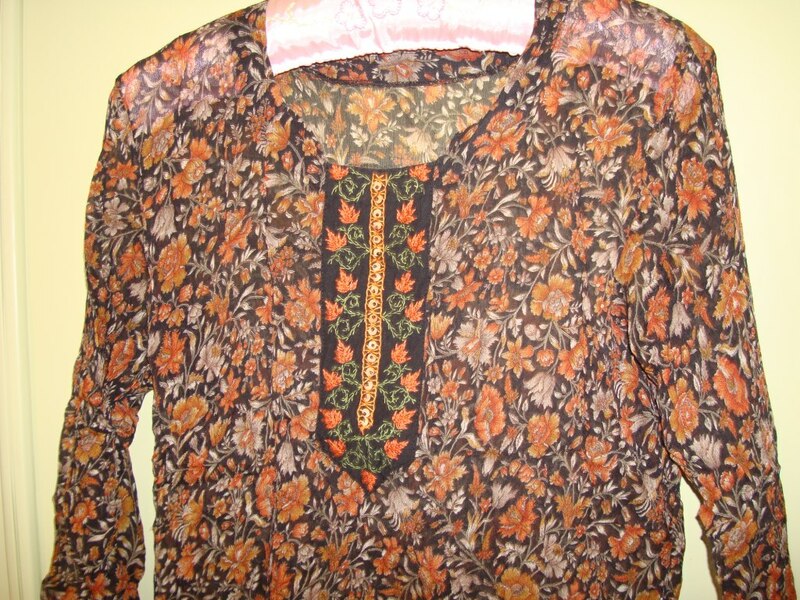 This is individual preference, it can be long, short or medium or just a single motif. 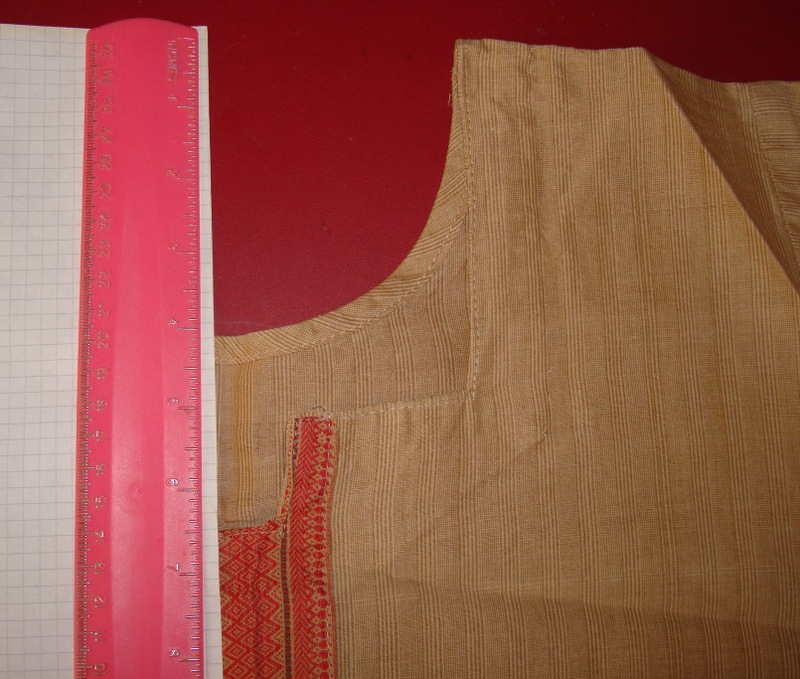 The same way, the length of the side slits can also be measured. 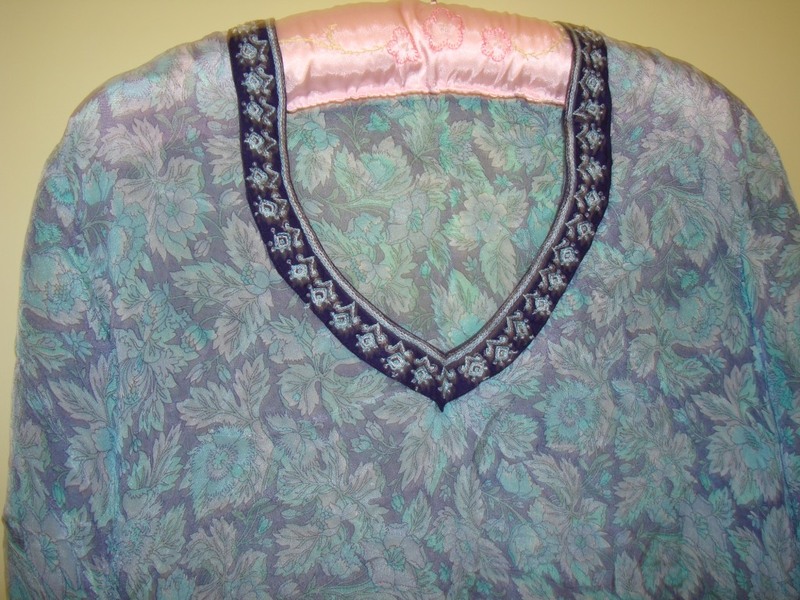 Sometimes a border attached at the end of the tunic gives an elegant look. 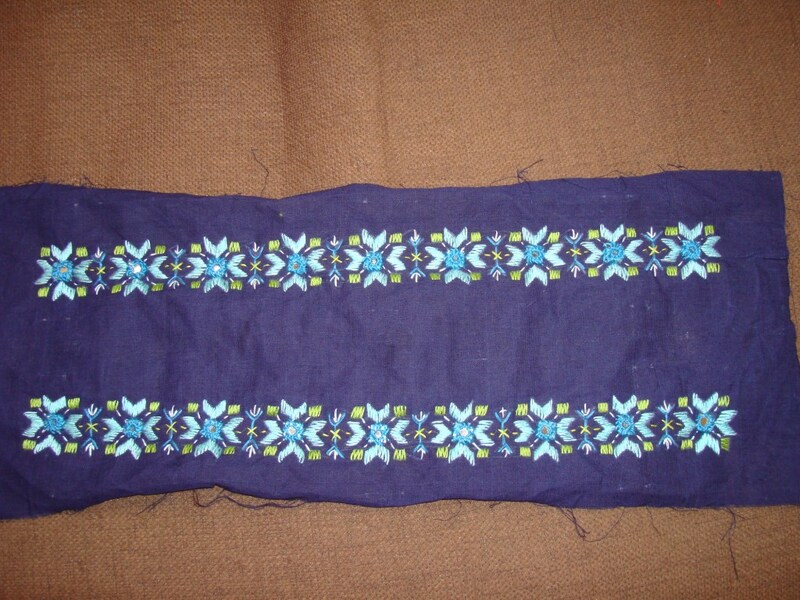 This kind of borders are fairly long. 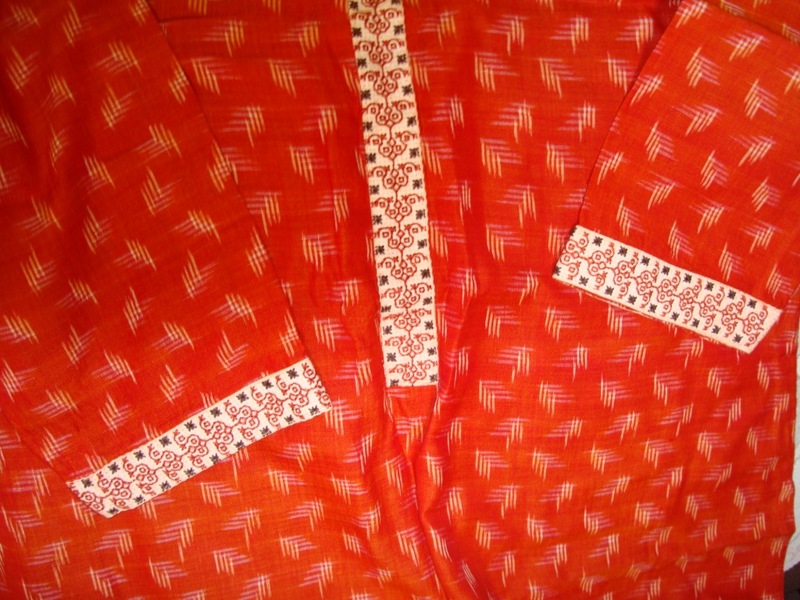 Ideal thing would be to use woven borders from sarees or dupattas. 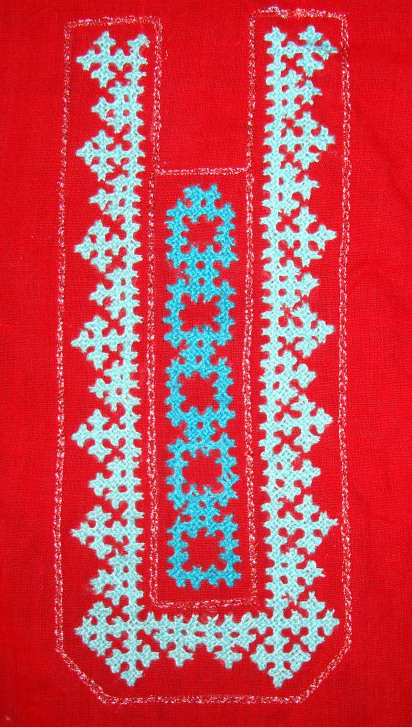 These borders can also be embellished with embroidery. 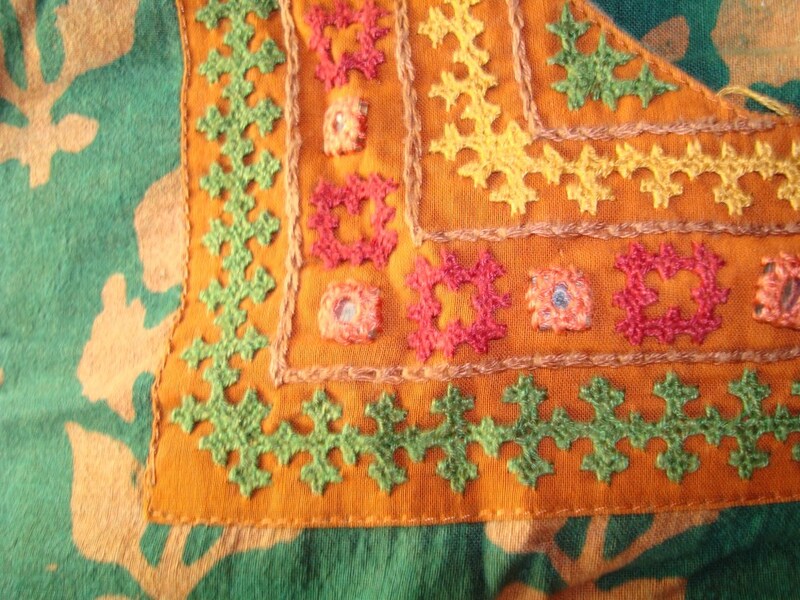 For all these embroidered borders, leave a seam allowance of ¾ inch on all sides. 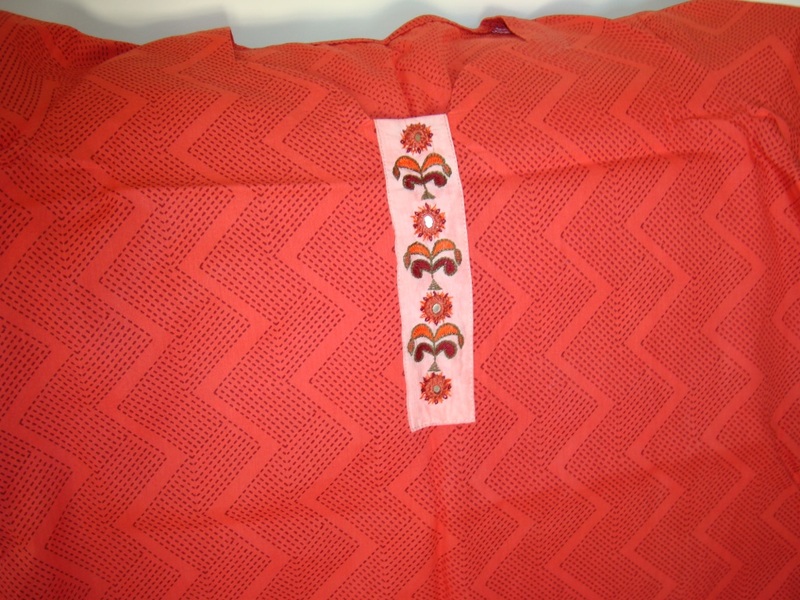 When using an embroidery hoop we need more fabric around the pattern to fit the hoop. 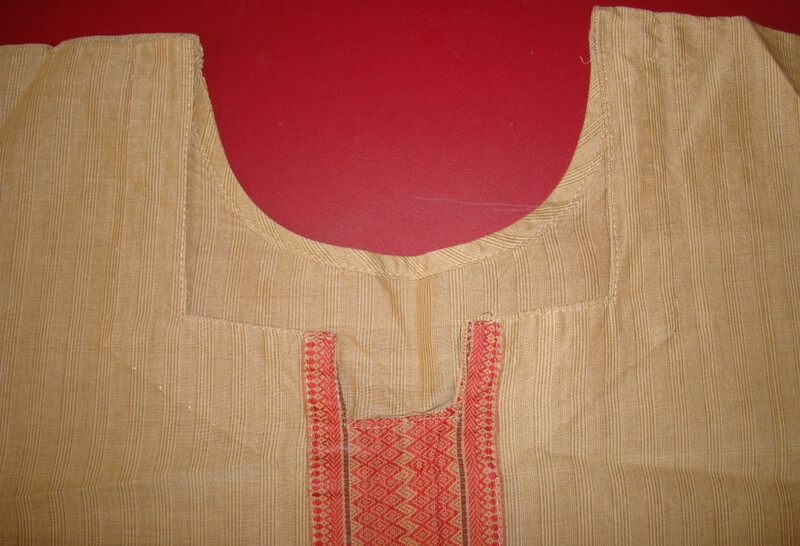 These extra fabric can be cut after the work. 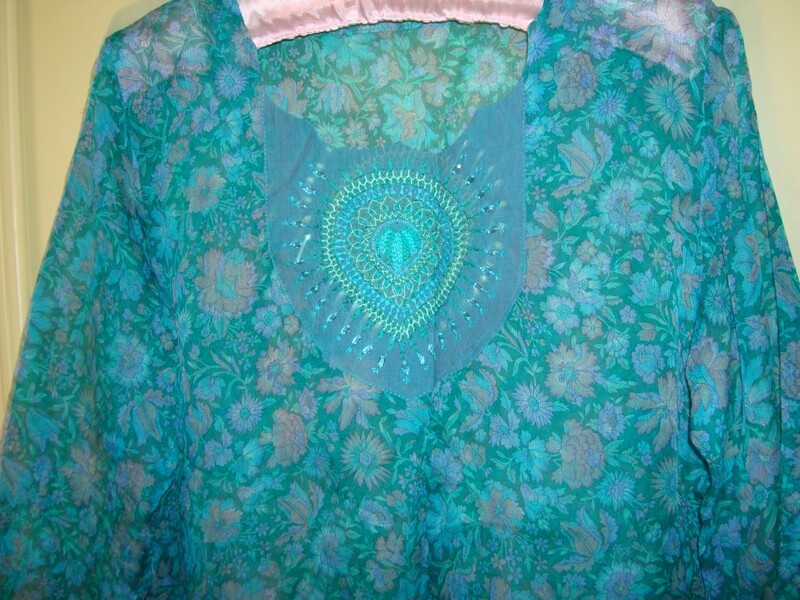 This is an interesting task. 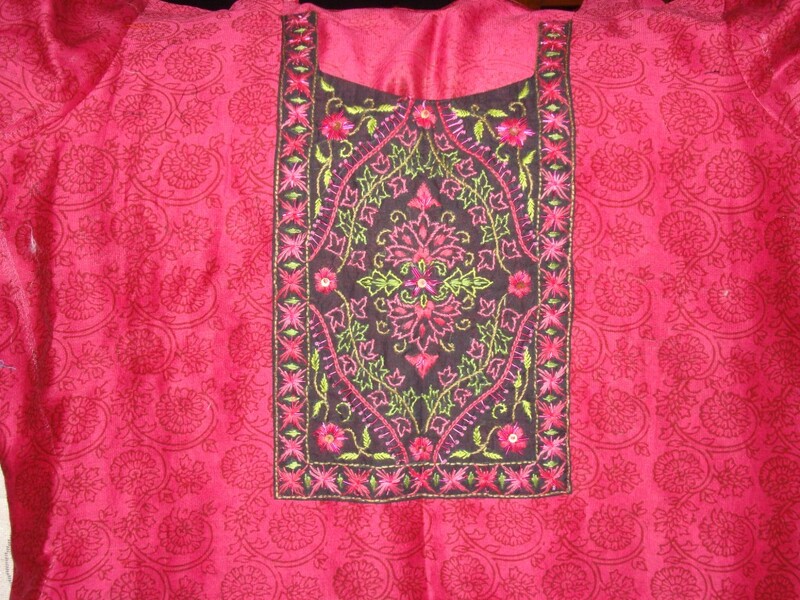 With the tunic fabric in hand choose the matching fabric to work the embroidery on. 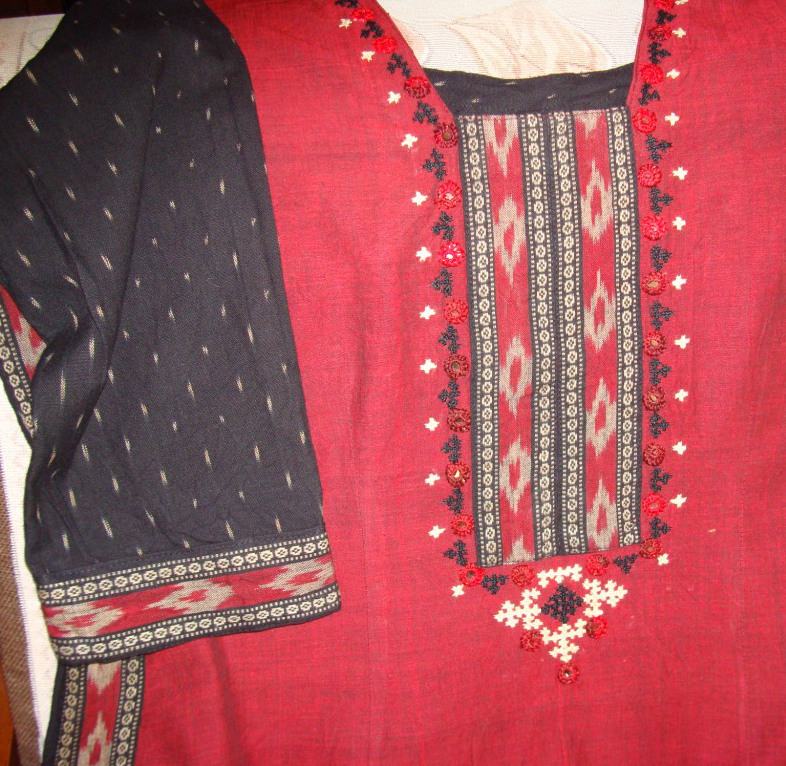 This can be the base colour or contrast or small speck of colour from the tunic design itself. This is a very wild field. 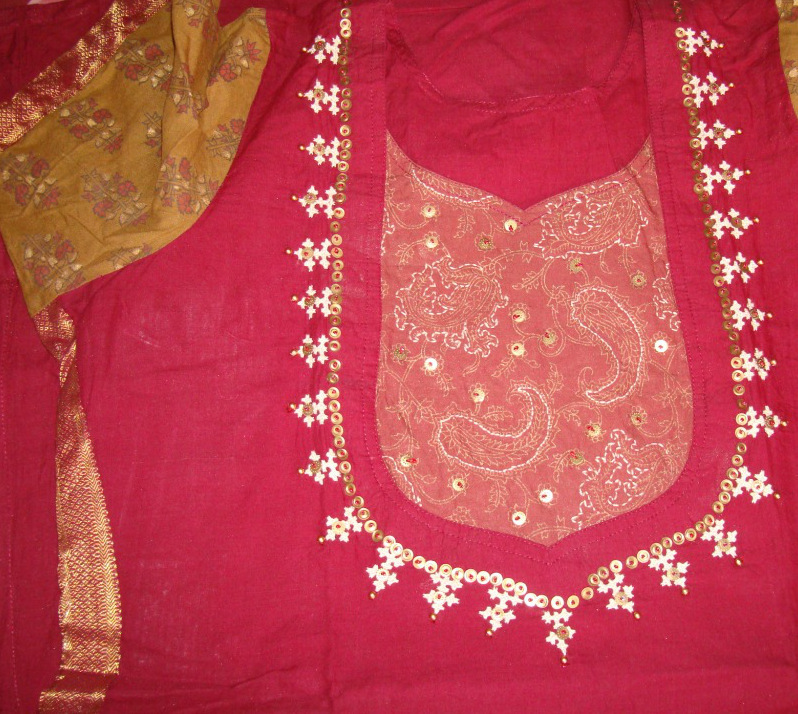 For choosing the pattern for embroidery, it is required to have some embroidery patterns. 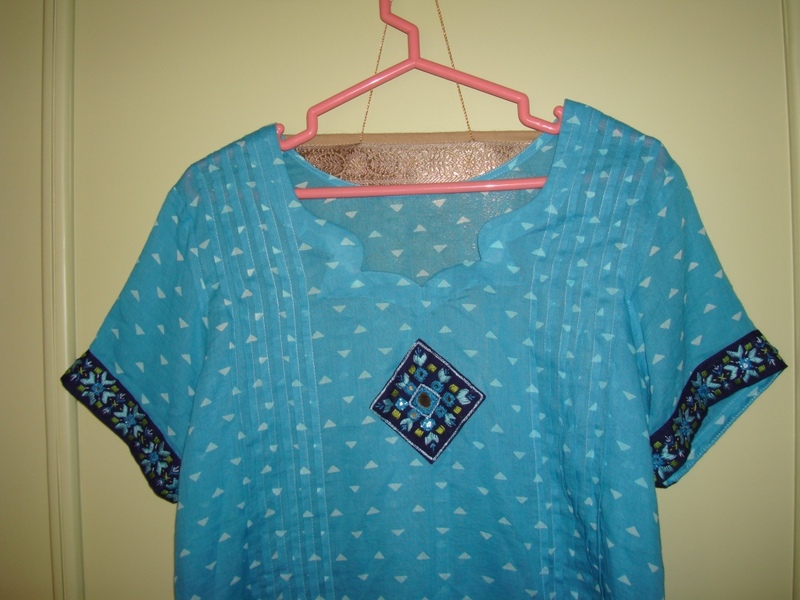 I generally use the available pattern as an inspiration and create my own designs. 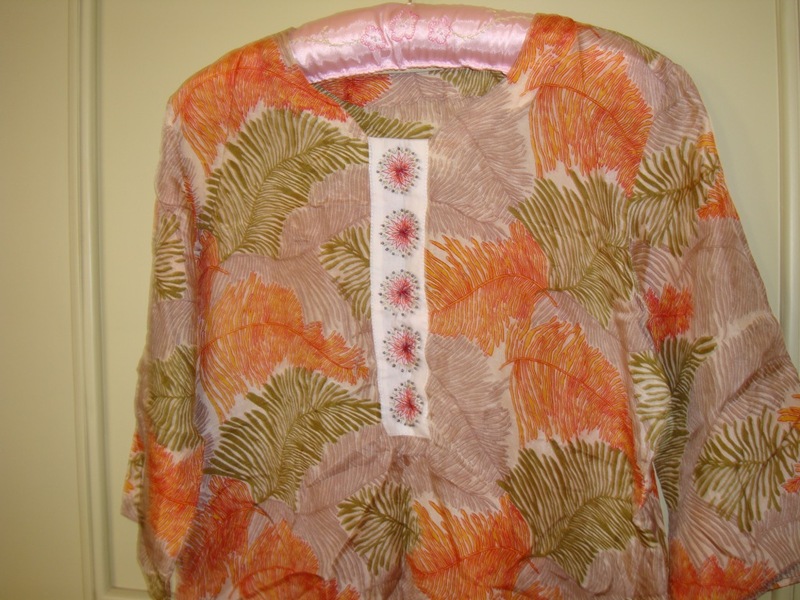 In this sample, the tunic is plain chiffon, the fabric used for embroidery is of the same colour in silk cotton. 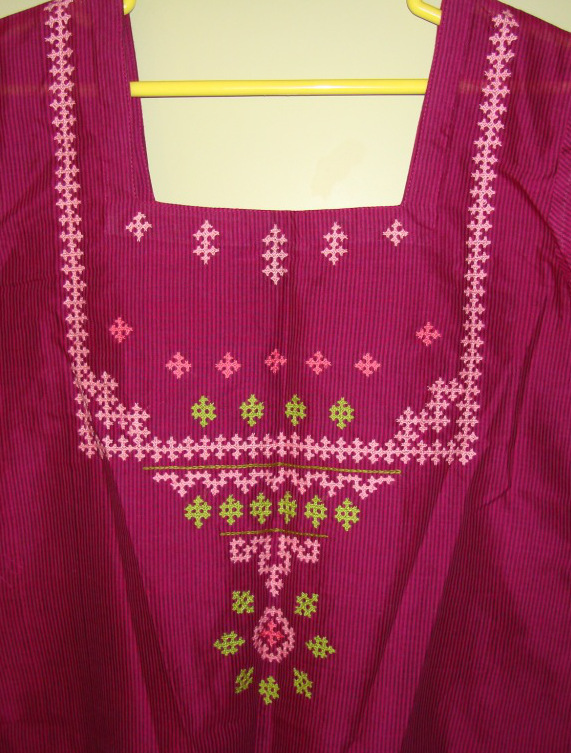 The pattern is single flower motif which is repeated for the length required. 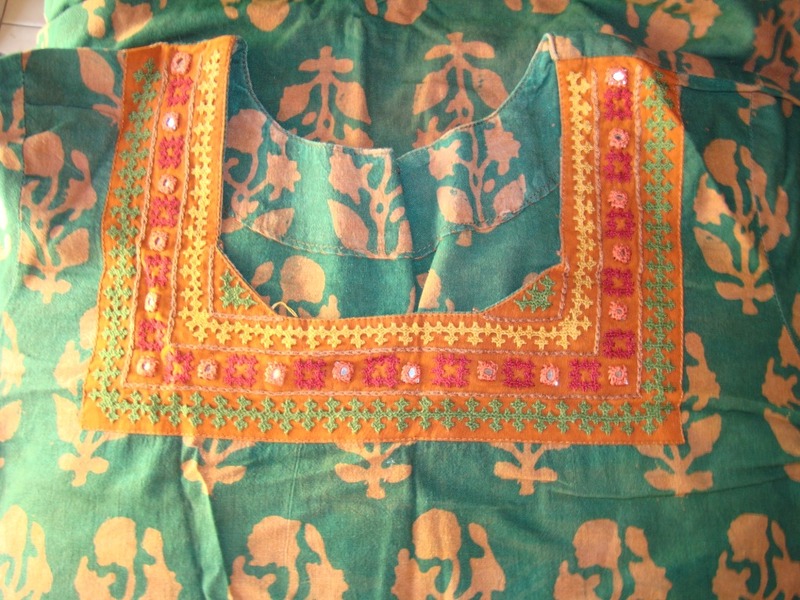 The width of the border is doubled for the tunic front. 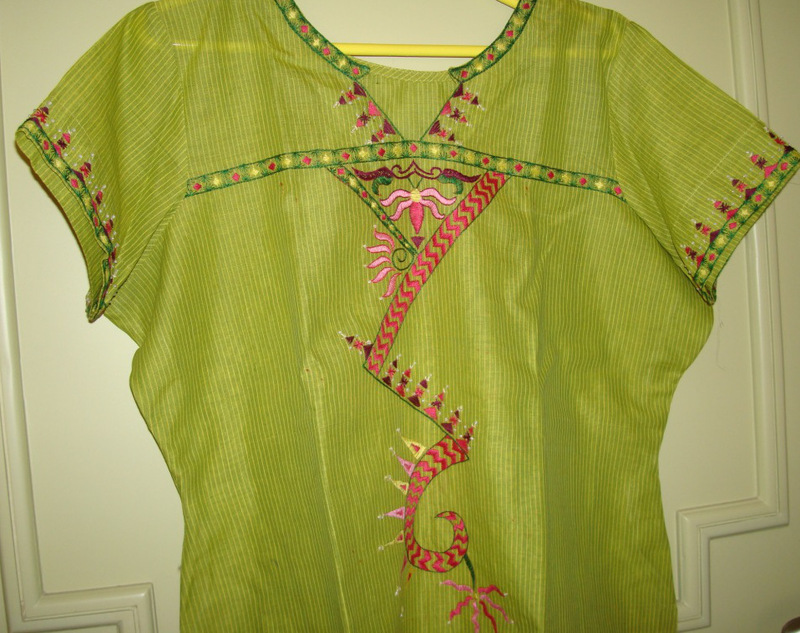 The length is medium. 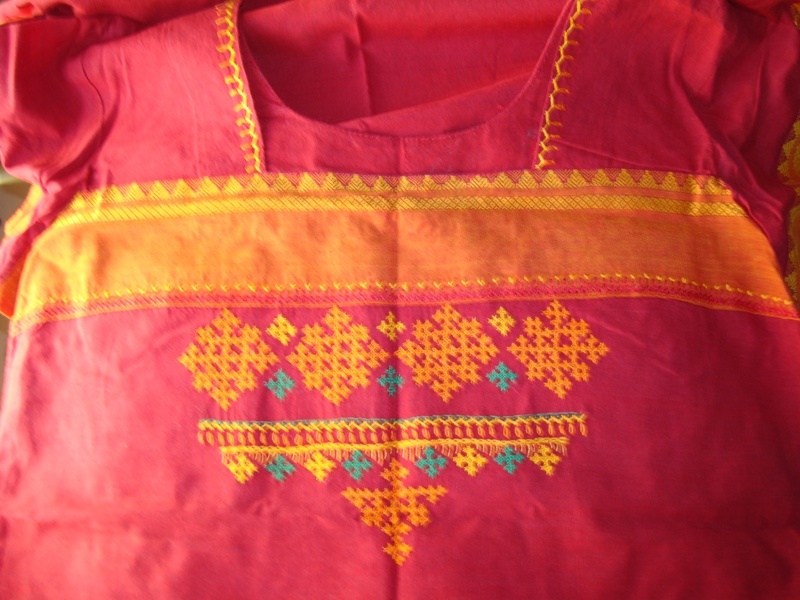 And the embroidery is done in contrasting colours. 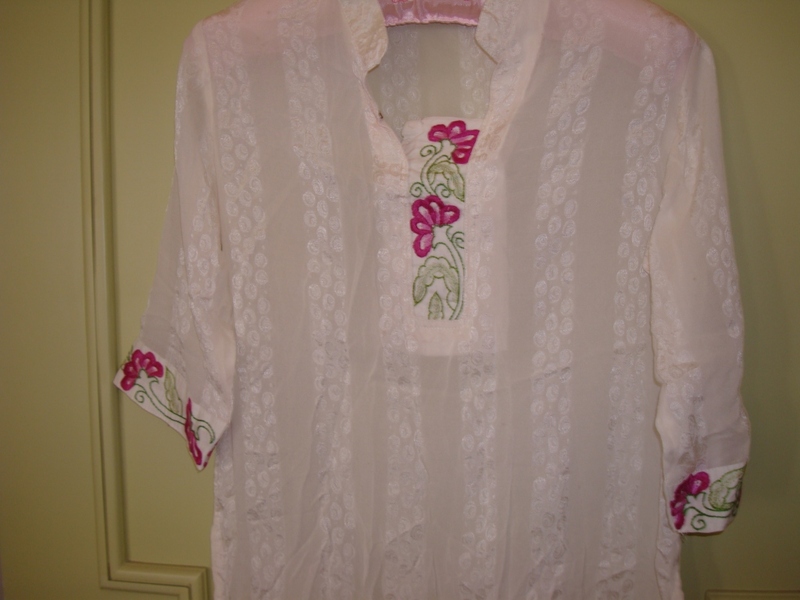 The tunic fabric is silk chiffon, and the embroidery was done in white cotton fabric. 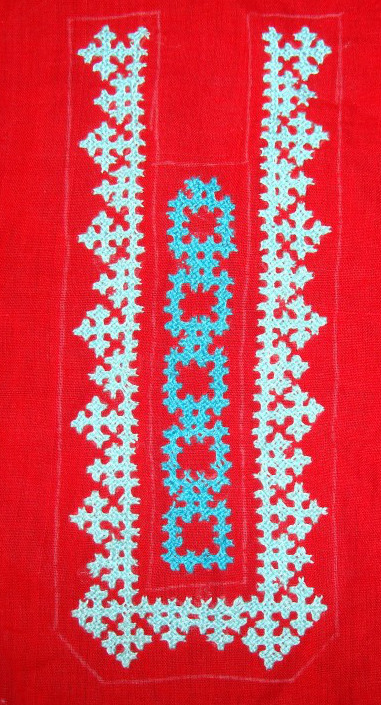 The pattern –a design of flower with leaves is continued for the length of the border. 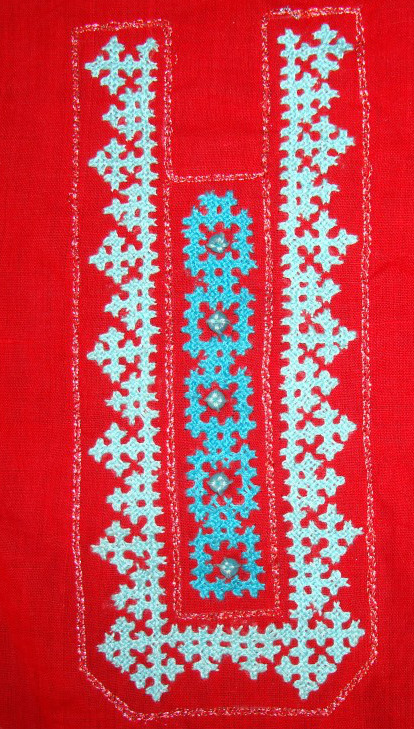 The border is short in front of the tunic.The embroidery is used to bring in some colour on white background. 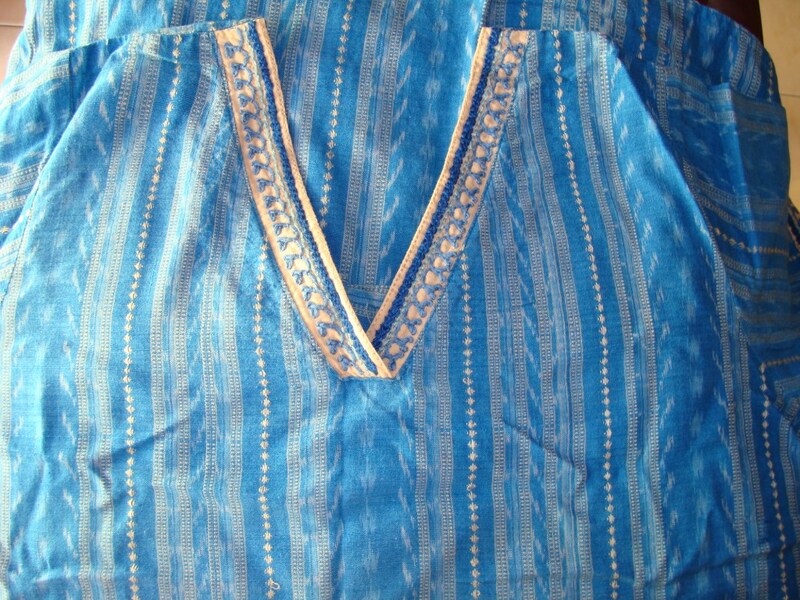 The tunic fabric is silk. 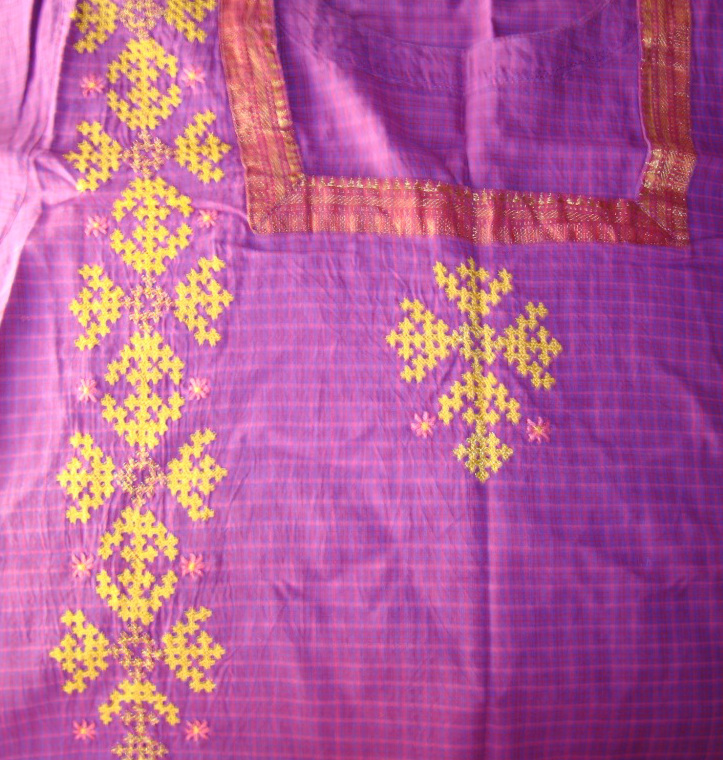 The fabric used for embroidery is cotton of the same colour. 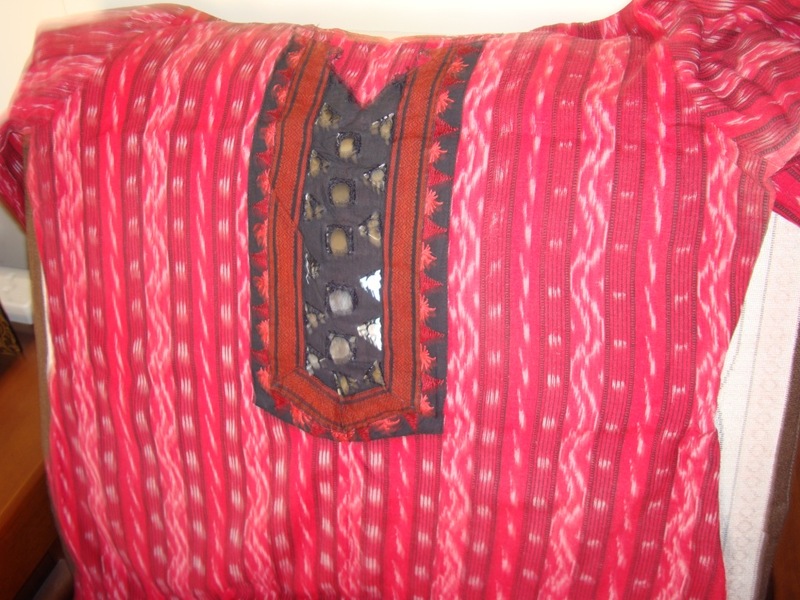 A simple circular pattern is repeated here. 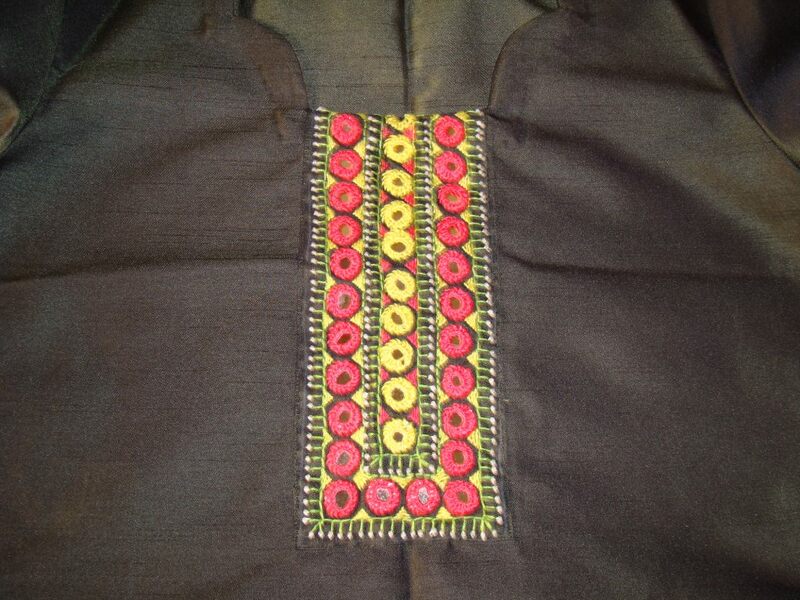 The threads used are chosen from the leaf colours on the tunic, and worked with dark brown seed beads. 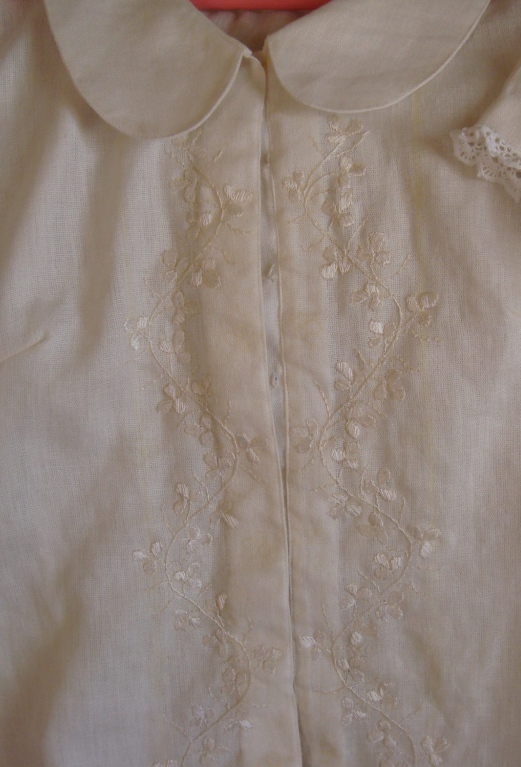 The embroidery does not extend to sleeves. 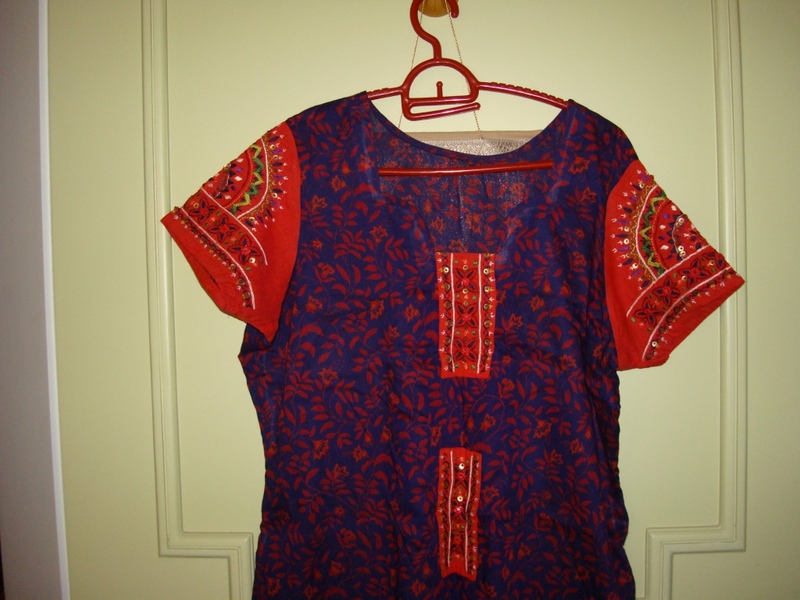 The tunic fabric is block printed cotton. 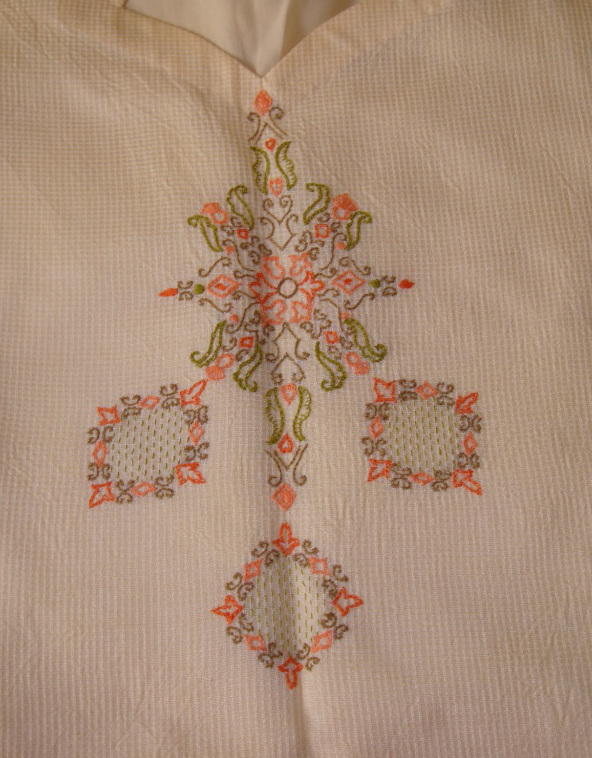 The embroidery is done on contrasting half white colour fabric. 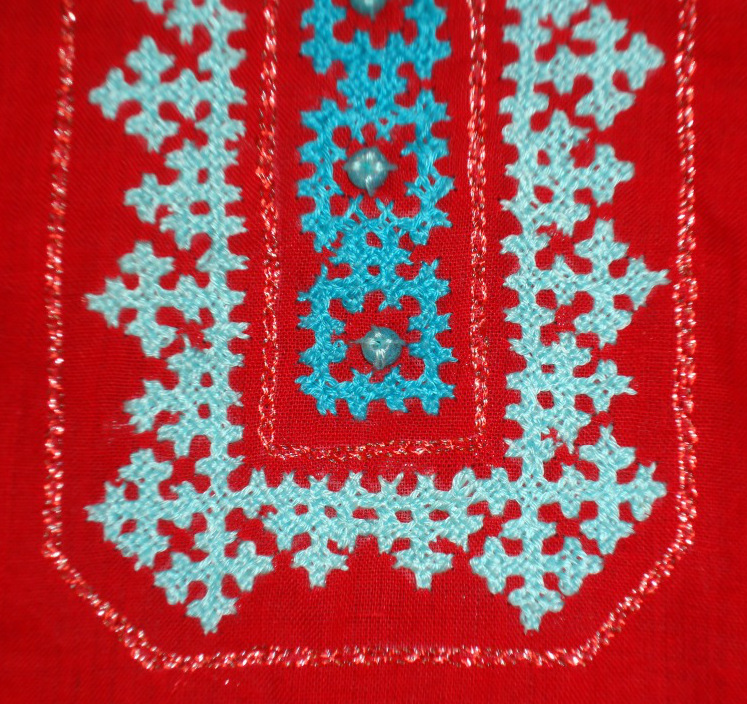 The motif is repeated along with some mirrors on this border. 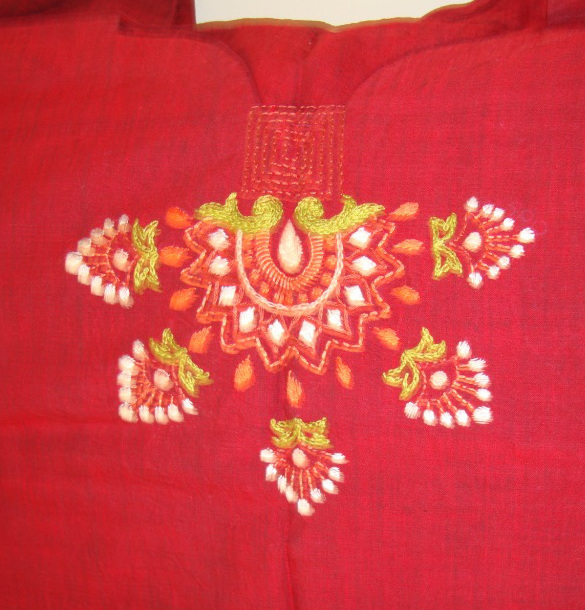 Colours for embroidery was chosen from Gujarathi embroidery and the colour of the tunic which inspired this pattern. 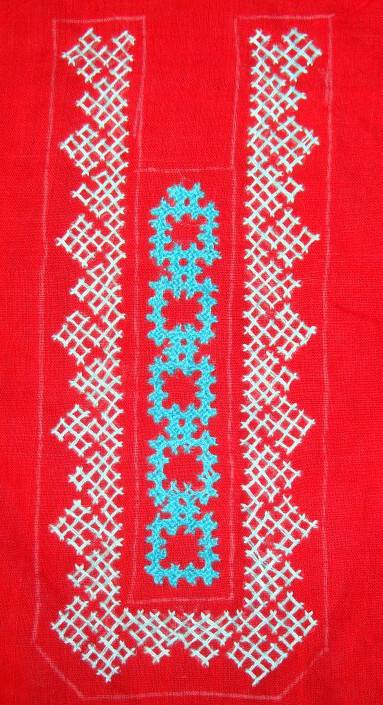 We will continue with some more samples on borders. 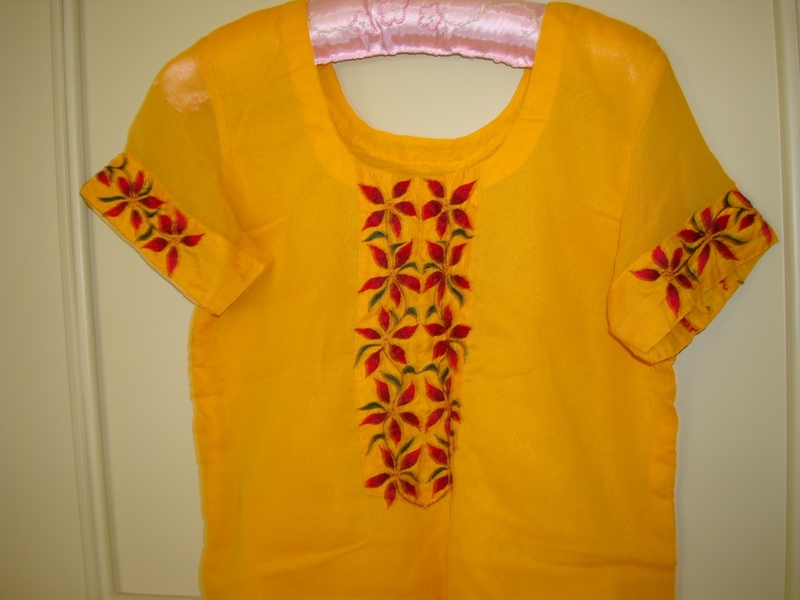 These samples are given here to get an idea about working embroidery on tunics. 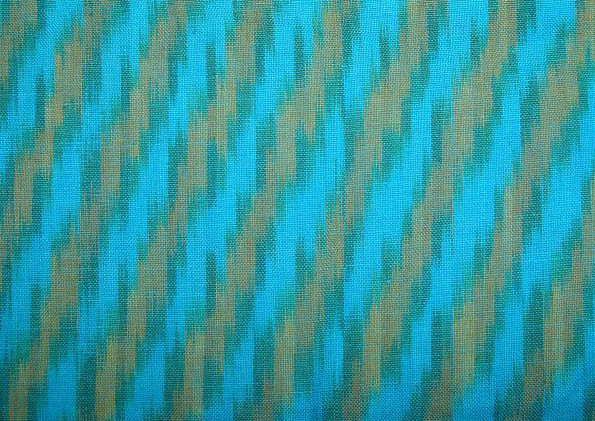 more details on patterns will come later in the series.Feel free to ask questions on comments, it would help me to improve this series.